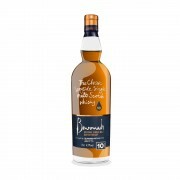 Benromach are on a roll, and have been releasing some interesting whiskies in the last few years, apart from the staple 10 and 100 proof which have become favorites of many whisky lovers, they have released a few finishes such as the Sasicaia , Hermitage as well as older whiskies (the 35 yo for example). This time they have decided to experiment with triple distillation, meaning the liquid was distilled once in the wash still, and then twice in the spirit still, before being matured in first-fill bourbon barrels for eight years. Triple distillation strips the heavier chemical compounds from the liquid, thus making the whisky lighter / “smoother” or so. Quite an interesting experiment, let’s see how the benromach liquid changes with an additional round of distillation. at 50% abv this comes at a nice strength, and there are ‘only’ 15,600 bottles available. Nose: The nose does feel a bit ‘lighter’ than the regular 10, with most of the smoke stripped down, the fruity side is still similar with some apple / pear , some wood and citrus notes as well. a few hints of smoke (but very subtle), orange peel, and toasted wood, ginger and fresh gouache paint. Palate: The initial mouthfeel is quite nice, with a heavier feeling than the nose, but again, much lighter than the 10-year-old , lemon drops, more smoke, and bitter wood, a certain waxy feeling to it, and more of the gouache, pepper and pear, even some bitter grapefruit, slight vanilla and metal. Finish: Lemony, zesty, with smoke, drying. This is a good whisky indeed, but it suffers when compared to the excellent 10-year-old. It feels lighter as expected with more zest, and less smoke, the sherry is not present at all, and it feels ‘thinner’. An interesting experiment, but it does not match the quality, and spectrum of flavours of the regular 10-year-old. However, if you’re a fan of the distillery and feel like trying something a bit different, it’s a good option. @galg, thanks for your review. Sounds like the third distillation has castrated the flavour out of it. "Light" and "smooth" are dirty words to a lot of whisky lovers. How do you get access to all of these whiskies in Israel? I thought it was expensive and hard to find (Except Ben GURION DF- some good gems I found there). I'm planning a trip in the next couple of years. If you follow me we can discuss samples that I might be able to bring you. @galg Seems a bit of a wasted exercise on Benromach's part. Why sully your considerable reputation by putting out a lowest common denominator weakling when your OB 10 is so highly thought of. I suppose the only reason is to appeal to a wider, less sophisticated consumer segment. I get all sort of samples from distilleries (as i have a very popular whisky blog), and some i buy and trade with friends. Israel has transformed itself when it comes to whisky, from a few years back. tax has been cut on whisky, as it used to be 100% on top of the whisky PRICE, and now is only taxed per liter of alcohol regardless of price, the expensive whiskies are well priced now over here. most shops have a very decent selection of OBs so much more than in the past.